Let’s face it, keeping a lawn lush, lively and green with temperamental Texas weather is no small task. It’s not impossible, and obviously Blooms Landcare takes pride in the many Fort Worth lawns we service, which flourish, even in the August heat. But there are other ways to win at landscaping. Many Texas families are choosing low-maintenance artificial turf to make their yards the envy of the neighborhood. 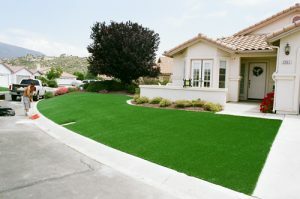 Often times, the main hesitation comes in considering the artificial turf cost. How can a family get the best value? The prevalence of do-it-yourself television and tight family budgets, have led many to think they’re ready to tackle any home renovation or installation, in an effort to save a few dollars. However, having a professional, like the Blooms Landcare technicians, install your artificial turf can save you time and money when it comes to lifetime value. How Much is Artificial Turf? What you really want to know is how much does artificial turf cost? Including installation, the average American family spends $4,463 on artificial turf. That may seem like a big expense, especially when an install for traditional sod only runs $1,735. But once the turf is in, it’s done. Leaves still have to be removed and there’s the occasional rinse (regularly for pet owners) but for the next 15 to 25 years, depending on product selection, you’re sitting pretty on a perfect lawn. The average U.S. household spends anywhere from $700 to more than $3,000 per year, just for the lawn to be mowed. This does not include additional costs such as increased water bills, weeding, fertilizing, aerating, sprinkler systems, lawn mower maintenance and more. When you factor in time savings, for those who mow and maintain their own lawns, the value of artificial turf begins to really shine. With all those savings, we bet you can already see yourself relaxing on your artificial lawn instead of sweating away to maintain a natural one. Let the Blooms Landcare technicians do the hard work, so you don’t have to. To get more information or request a quote for artificial turf, contact us. Call Blooms Landcare today at (817) 688-5352. The Blooms Landcare team has been providing high-quality landscaping services in the Fort Worth area since 2006. Our team of design experts can assist you in transforming any residential or commercial outdoor space. From stunning gardens to functional patios, you can trust Blooms to deliver exceptional service. © Copyright Blooms Landcare 2019. All rights reserved.